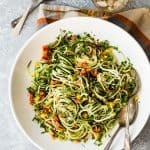 Fresh spiralized cucumber with cilantro for this easy salad. Place the spiraled cucumber on some paper towels and let sit for 5 minutes to absorb any water. Add the cucumber noodles to a large bowl along with the diced red and yellow peppers. Add the chopped cilantro, red pepper flakes, salt, and black pepper. In a separate smaller bowl whisk together the lime juice, olive oil, salt, and black pepper. Add the dressing to the cucumber noodles and toss gently but making sure to coat all of the cucumber. Transfer to a serving platter and serve at once or store covered in the refrigerator. This recipe will make enough salad for 4 small appetizer portions or two good sized lunch salads.